Krystal is a talented dancer who has a big salsa competition coming up very soon – and no, I don’t mean the kind of salsa you eat with chips. That does sound like my kind of competition, though! Anyway, Karen wants to wear something fun and colorful to her performance, and she would love your help in picking an outfit to dance in. Choose from frilly tutus, sparkling twirling dresses, and fluffy skirts with lots of ruffled layers. I hope you’ve had your caffeine today because we’ll be dancing the salsa all night long! Well, Karen will be – we’ll be watching from the stands while we’re eating salsa and chips! I kind of have a craving now. 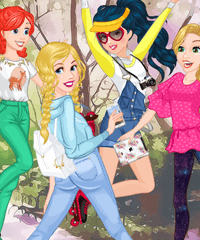 Either way, you’ll have fun playing this bright and cheerful dress-up game.